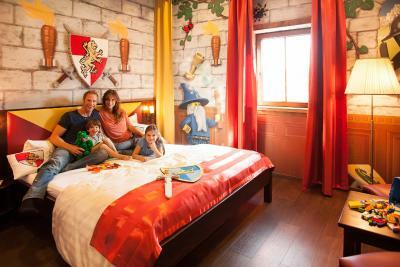 Lock in a great price for LEGOLAND Feriendorf – rated 8.6 by recent guests! The room was close to Legoland which made for an easy day. The parks near the hotel was great for after Legoland closed. Great for the kids gets them into the spirit of legoland You can spend a whole day with the kids just in the resort without entering the park., they just need to emphesis that there is no Aircon in the rooms. 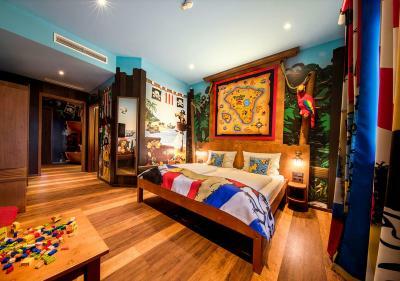 Themed room perfect for small children. Restaurants and playgrounds were easily accessible. Staff are nice and very accomodating. Every where their is a playground with diffrent theme. 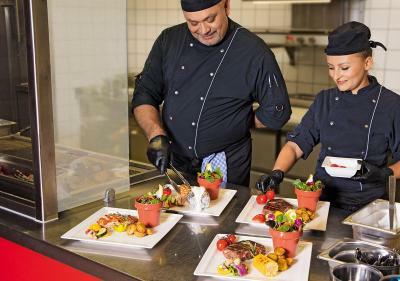 This property opened in 2018 and is just a 5-minute walk from the LEGOLAND Feriendorf in Günzburg, and features four restaurants and two bars. 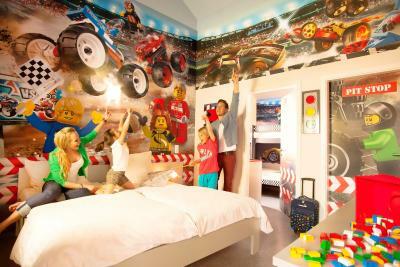 The rooms at LEGOLAND Feriendorf are decorated in a variety of colorful themes, and WiFi is free in public areas. Rooms feature a flat-screen TV, patio and private bathroom. They all have their own fun styles, such as ancient Egypt or motor racing. 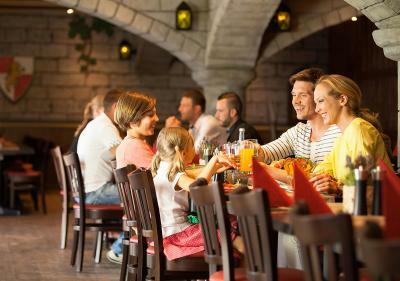 LEGOLAND Feriendorf offers a Steak House with high quality meat dishes, and the Zur Tafelrunde restaurant offers stone-oven pizzas. 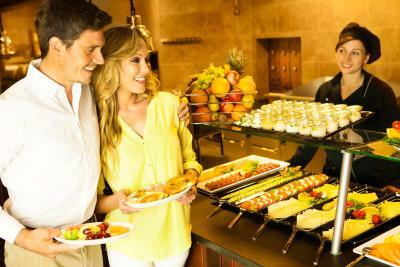 A number of different themed buffets are served at the Dschungel Restaurant, and a buffet breakfast is also provided. 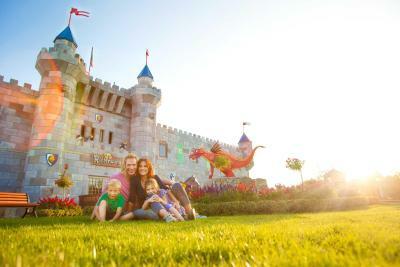 At the reception, guests can purchase tickets for the LEGOLAND amusement park for an additional surcharge. 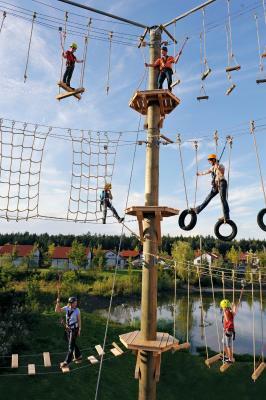 Fun family activities on site include a high ropes course, bowling and a tricycle course. 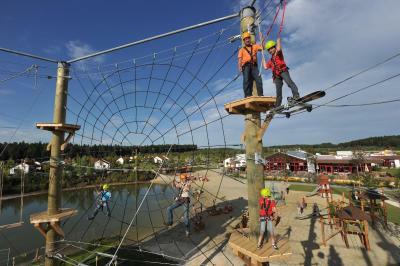 Younger guests can enjoy 18 children’s playgrounds in different styles. 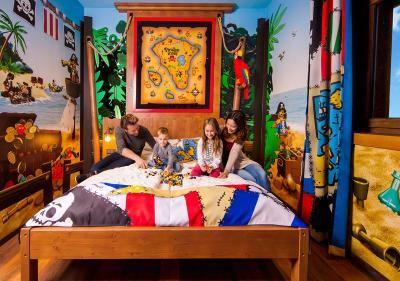 Guests staying at this accommodations can purchase reduced tickets to the LEGOLAND Park at reception or reserve them via email. 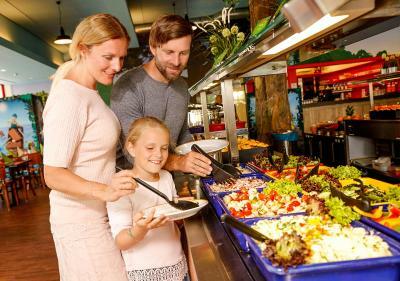 Guests have easy access to the LEGOLAND Feriendorf from the A8, which is 0.9 mi away. Günzburg and Wasserburg Train Stations are both within 3.1 mi. 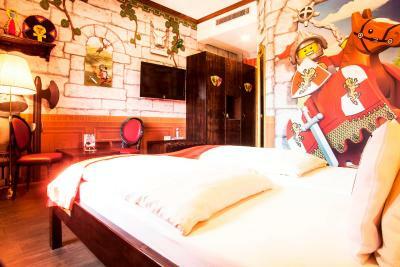 When would you like to stay at LEGOLAND Feriendorf? Themed room featuring a flat-screen TV, a terrace and a hairdryer. Free WiFi is available in public areas. 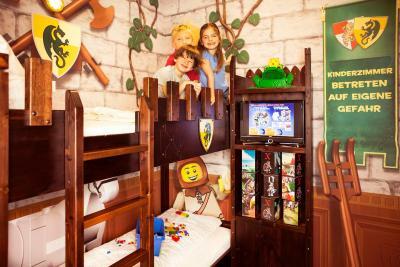 Please note that tickets to LEGOLAND Park are not included in the room rate. 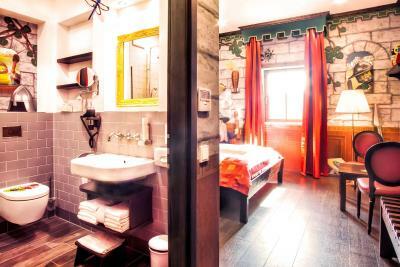 Castle-themed room featuring a flat-screen TV and a bathroom with a hairdryer. Free WiFi is available in public areas. The heated Camping Barrel features a cool-box and a terrace. There are shared bathroom facilities close by, and free WiFi in public areas. 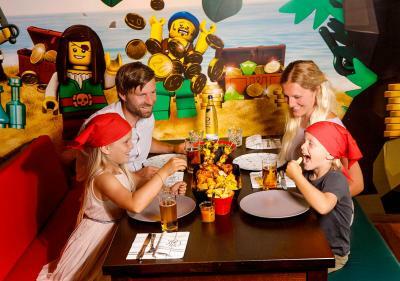 House Rules LEGOLAND Feriendorf takes special requests – add in the next step! LEGOLAND Feriendorf accepts these cards and reserves the right to temporarily hold an amount prior to arrival. Please inform the property in advance about the age and number of children. Please note that only children under 3 years stay at the property free of charge. Children age 3 years and older pay the full price. Please note that hotel reservations at the property does not include park tickets. They didn’t have porter service which we needed being a big family with children mostly! The WiFi never worked the entire time we were there so don’t rely on the WiFi. 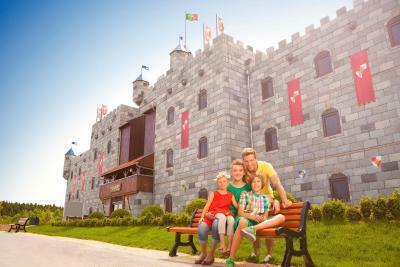 Perfect for visitors of Legoland Park. 2-3 good restaurants in the area of the hotel. Recommended! There is no reception at the building and need to go outside (100 meters - so not good in cold conditions). Also you need to purchase the minibar stuff separately and its not very convenient (they should find another way). Location of the hotel vs. Legoland is not necessarily bringing much additional value (in essence you can stay in another place outside and reach the parking of the Legoland - not much difference vs. staying at the hotel inside). Maybe it is convenient when the place is very busy (which was not during our stay). Parking is outdoors only. Not sufficient lighting. Clean and easy to access rooms ergonomically designed. Breakfast very good, but staff not organized and not very friendly. 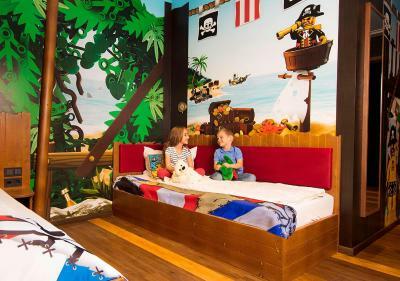 The walls of the room got dressed in Lego Pirates designed wall paper. It makes fun atmosphere, but a little bit too annoying. It might be only our room but there is no bathtub, only shower available. The room layout is a little bit strange. The kids bed is installed right near by entrance door. It makes me something a little bit anxious. Highly recommend for people who wants to enjoy fully in Legoland. 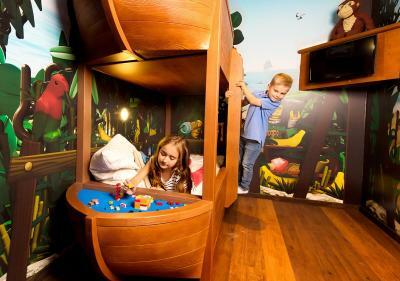 Easy access, great atmosphere, you can totally dive into Lego world. The whole facilities are really new. Lego classic basic blocks are prepared near by kids bed. A stool is prepared in a bathroom which helps kids to reach tap of washstand. The information about the theme room was decieving. We had a small cabin-like facility with very little light and near a park that kids played at until after 10 pm. I don't feel like the cost was worth the actual room. Loved the room the showers the restraunt breakfast and short walk to the park. So clean.. friendly staff, nice breakfast.